The global facilities management market is moderately consolidated with the presence of several large players that operate globally and regional players that mainly operate in local markets. Large players are resorting to strategic partnerships with small vendors to expand their service offerings and to expand their geographical presence. Partnerships and alliances are also helping large vendors to provide bundled facilities management services with the objective to offer value-added and quality services to their clients. Bundled services not only helps drive efficiency and cost benefits for vendors, it helps improve long-term relationship between the client and service provider. Key companies operating in the global facilities management market are Arthur McKay & Co. Ltd., Bilfinger HSG Facility Management GmbH, Bellrock Property & Facilities Management Limited, Broadspectrum (Australia) Pty Limited, and ISS World Services A/S among others. 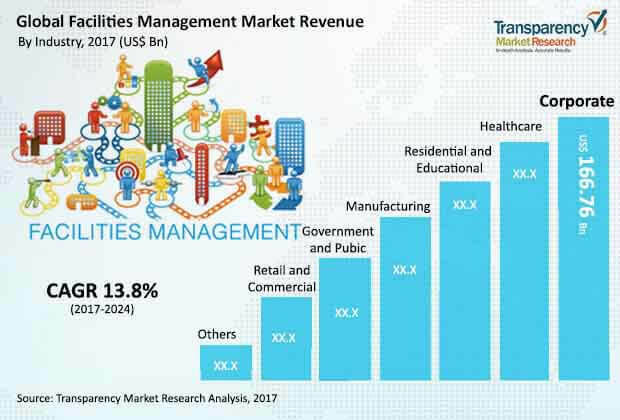 As per a report by Transparency Market Research (TMR), the global facilities management market is projected to clock an impressive 13.8% CAGR between 2017 and 2024, for the market to be worth US$1887.19 bn by 2024. The opportunities in the market translated into a revenue of US$762.07 bn in 2017. By service type, soft services hold dominance with the segment anticipated to hold 62.3% of the overall market by 2024; the growth of soft services segment is mainly because of their growing demand in healthcare, corporate, and government sectors. In terms of industry, corporate segment holds prominence and the trend is estimated to remain this way through 2024. Attributed to the growth of business activities and service offerings, the corporate sector is anticipated to hold 24.0% of the overall market by 2024. North America, among key regions currently leads the facilities management market due to extensive availability of low-cost and high-quality facilities management service providers in the region. Majorly fuelling the global facilities management market is reduction in operating costs for businesses. Economic burden on companies is increasing due to operational and maintenance costs. Facilities management service providers offer a gamut of services to support businesses. Large organizations and businesses outsource facilities management services such as maintenance, cleaning, and security, which allows them to focus on core business activities. Excessive energy consumption accounts as additional operational costs for businesses. To address this, facilities management companies develop an integrated design for energy needs of businesses which helps reduce energy consumption and improve performance. This helps businesses reduce operational and maintenance costs. Increasing government regulations in place to optimize energy consumption to curb carbon emissions and statutes for proper disposal of waste have compelled organizations to engage facilities management services. For instance, the Energy Policy Act of 1992 laid down by the federal government in the U.S. focuses on energy reduction and guidelines for the implementation of conservation measures. Facilities management service providers keep a log of emissions produced by businesses and develop an energy flow solution that is sustainable in the long run. On the flip side, increasing number of facilities management service providers due to potential of this market has led to price wars among these companies. Increasing presence of small vendors that deliver par excellence services at low prices has forced large companies to serve at competitive prices. This is impacting the revenue of the overall market. Lack of availability of skilled manpower is also hampering the growth of facilities management market. Facilities management personnel need to receive appropriate training for proper delivery of services, especially for fire and security systems.